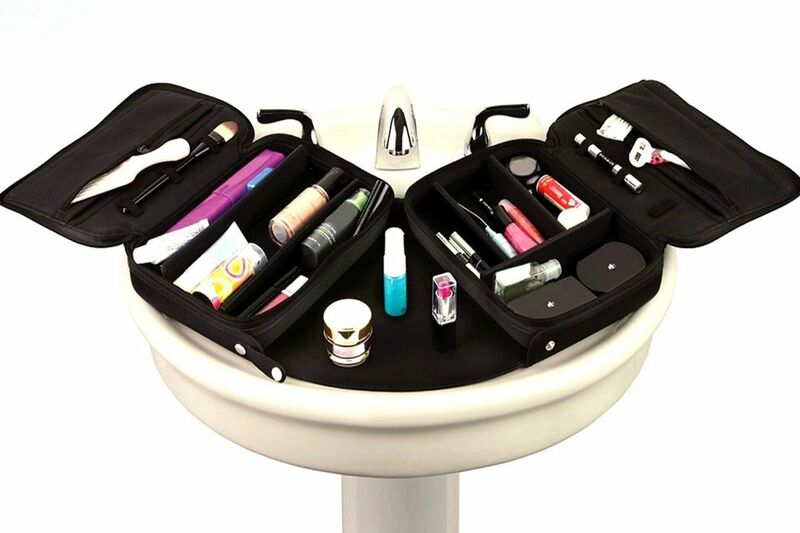 Even a small sink can accommodate the ORGO Expandable Counter and Toiletry Kit. Why is it that, no matter how luxurious and spacious your hotel room or cruise ship cabin may be, counter space — especially in the bathroom — is usually minimal? A hanging organizer bag can hold your essentials within reach. But set them on some meager perch and you risk having your hairbrush, toothpaste, lipstick, and/or pill bottles sliding into the sink or onto the floor. Drum roll, please, for the ORGO, an ingenious travel organizer system that incorporates its own built-in counter space. Unsnap the little tab connecting the two 7.5-inch-wide by 11-inch-long by 2-inch-deep zippered polyester cases. When you start to pull them apart, they will pivot out along an interconnected hardback open platform. Unzip and flip open the lids, and the whole kit expands into a 36-inch-wide curved work station you can plunk down sturdily over the sink. Then just pluck your toiletries, makeup and/or medications from the sectional compartments, zippered pockets, and elastic grips in the cases and the inner lids, and assemble as needed on the surface between the two cases. Removable inserts let you customize the storage space in the two cases — or leave it open. The ORGO needn't be confined to the bathroom. It works great as laptop work/play station in a car or plane, packed with toys, electronic devices, or craft supplies. It is available in solid colors or snazzy patterns. All closed up, the ORGO measures 15 inches by 11 inches by 2 inches deep, and stashes easily into a carry-on bag or tote. Empty, it weighs less than two pounds. ORGO Expandable Travel Organizer System is $25.99 to $35.99, depending on color/pattern at www.everythingorgo.com.